End Time Prophecy about to be fulfilled? Darwin, in his own writings, questioned whether his “theory” would hold up. Darwin stated that the theory of evolution requires that innumerable transitional fossils must be found to prove evolution theory is correct. Transitional fossils must be found to prove evolution. We still don’t have the fossil evidence to support evolution. The theory still exists, but the evidence does not. In fact, today science knows that many of the theorized transitional forms were actually contemporaries (existing at the same time). Homo sapiens (us), Neanderthal (archaic Homo sapiens), Homo erectus, and Homo habilis, were all contemporaries, existing at the same time, and thought by science today to have even interbred. In other words, the fossils look a little different, but they appear no different than Eskimos and Europeans look today. In the book “Science, Origins, & Ancient Civilizations,” on pages 67-84, fossils and DNA evidence for macro-evolution are discussed broadly. In an article titled “No Bones About It,” Dr. Cupps, PhD. in Nuclear physics, writes that the scientific observable evidence for macro-evolution has yet to be produced. 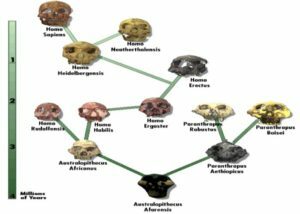 He states that in fact, just the opposite is true—evidence is pointing to a human family with different ethnic groups, with no evolution suggested. The book: “Science, Origins, & Ancient Civilizations” covers these issues concerning many human types (species) actually living at the same time (page 77). “The problem for life originating naturally is that science has discovered that DNA, proteins, RNA, and the cell are all required to develop simultaneously. None can exist without the other. Fred Hoyle, British Astronomer, and Francis Crick of the Salk Institute of Double Helix fame, have each suggested that life could not have begun without some unknown outside influence (space aliens). DNA, which stores genetic information (the blueprints of life molecules), cannot function without proteins, and RNA molecules. RNA (which transports the correct blueprints to the proper location site for life molecules), cannot function without proteins, DNA molecules, and a cell. Proteins cannot function without DNA and RNA molecules. A cell cannot survive without RNA molecules. For more on these subjects, please see the overview on this book as Pastor Burney goes through a good portion of his book on You Tube. If you’re interested i finding out more about the book on Science & Origins go to our YouTube Channel and watch some videos! Please visit Target Truth Ministries check out our website, today!. For those who have been able to get the book ”Eden to Evil”, we hope you are being challenged by it. Isn’t God’s word fun? We also hope you will be able to leave a note of encouragement on Amazon for others to read and help them to study God’s awesome Word further. Our Prison and Jail ministry is personally funded by the sales of our books through Amazon, or through our website, Target Truth Ministries, the book Chronologies And Time Charts is only available through our website. 100% of the book sale proceeds go directly into the ministry… No salaries or wages are paid through donations or book sales… All work is done by volunteers. Twice a month several volunteers from Crossroads Christian Church gather together for several hours to compile and mail off the weekly messages, (AKA Virtual Chapels) to Inmates and Prisoners incarcerated all across America! And, once a year every inmate on our mailing list gets a Christian book sent to them, but this is at no cost to the inmates. Want to get on our email list? Click on the “Join Our Mailing List” box on the right side of our website, Target Truth Ministries and enter your Name & email address. When you finish the book Eden to Evil we hope you’ll take a few moments and go to Amazon make a comment to encourage others to read about God’s word. Most government leaders have their view of the war against “radical Islam” backwards. Radical Islam is actually not radical. The people may call violent Islam “radical,” but this violent Islam actually represents true Islam as presented in the Koran and Hadith. The real radicals are those in Islam who embrace democracy and assimilation. True Islam relies upon the Koran and Hadith, both of which demand Sharia law and subjugation under that law—no democracy—no assimilation. Choosing the side of peaceful Islam is to wage war with the Koran. We in democracies who embrace assimilation, are in fact at war with the Koran, and those who truly worship by it. True Islam uses the Koran (Allah’s words), and the Hadith (Mohammed’s teachings). Mohammed’s journey began with a peaceful outreach, and when the peaceful path failed to attract people, Mohammed said that Allah led him to wage war against all that resist true Islam and Sharia. This is what the Koran and Hadith record. Our battle is only incidentally against what is commonly called “radical Islam” (those who practice true Islam and correctly interpret the Koran). Our battle is in reality against the Koran itself—the words received from Allah by Mohammed which demand the subjugation of non-Muslims, and waging war if necessary against resistance to true Islam and Sharia. This is why there is a great battle even within Islam itself…because the Koran records the final teachings and commands of Allah as demanding subjugation and war even against those within Islamic countries who do not surrender to Allah and Sharia. Peace is available in Islam, but peace is only available to those who surrender to Shira and authority passed on from Muhammed to the Imams and Islam’s leaders who truly follow Muhammed’s final teachings of subjugation to Allah—no assimilation, and no democracy. Christians in America used to welcome democracy, freedom, and assimilation. Unfortunately, in recent decades, America has decided to promote separation, and not assimilation, by embracing separate languages as an example. Not embracing the English language causes people to isolate themselves in certain geographic areas, forming communities which represent the old country, which can lead people within these language zones to not embrace America’s democratic form of governing. Without assimilation and democracy, we as a county are doomed to segregated, isolated cultural groups, each vying for power and influence over other groups. And, in the case of Islam, our nation faces eventual loss of democracy all together as it is replaced by Sharia and subjugation to Allah. Bottom line…America is not compatible with the Koran, which requires subjugation to Allah only—no democracy—no assimilation. I pray for all Islam to find true peace which only comes from Jesus.